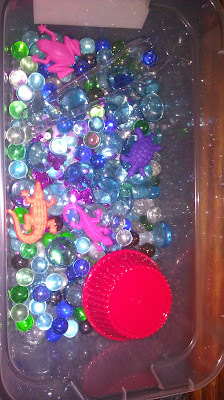 Sensory Boxes - I Love ABA! Sensory boxes are a fun tool you can use as a reinforcer/reward, during naturalistic teaching, or for calming/transitioning purposes. Sensory boxes can also be taught as a leisure skill activity or a play choice. Sensory boxes can be as diverse and varied as they need to be, based on what the child likes. Provide reinforcement to the child when they interact with a sensory box, to increase the likelihood that the child will play with the sensory box again in the future. Get a container with a lid that can be securely closed and fill it with various items such as pieces of fabric, beads, beans, rice, clay, sand, flour, water and ice, water and bubbles, glitter, confetti, pieces of string, lace, etc. A word of caution: before creating a sensory box check with the family first and make sure the child has no allergies. For example, if the child is allergic to latex that is something you need to know before making a sensory box. If you are working with a child who has mouthing behavior be sure to supervise them closely when they are manipulating a sensory box. I would also avoid very small items like beads, with a child who mouths as these could easily be swallowed faster than you can react. Look for larger items like pieces of fabric, OR things that are fine to eat such as dry cereal. I typically use sensory boxes with clients who can become overstimulated and need a calming, structured activity to engage in. I will also use a sensory box during transitions. For example, when I arrive to a session I might place a sensory box on the table as I prepare my materials so the child has something to engage with. Then when I am ready to begin work I add myself into the child's play. After that I slowly add in work, and remove the sensory box until later. Sensory activities should not be used as a way to reinforce inappropriate behaviors, or to allow a child to escape a task. 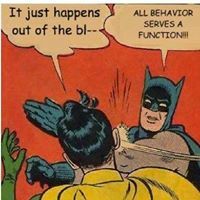 Please be careful not to use sensory tools, toys, or items in ways that will strengthen problem behaviors. 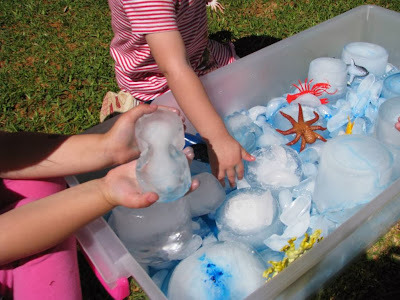 Sensory boxes can be used by anyone who interacts with the child and they are very simple and cheap to make. I am always a fan of free/ low cost ideas that can be incorporated into therapy. 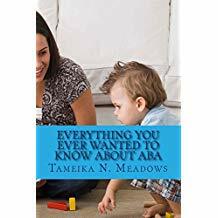 ABA does not need to break your wallet. 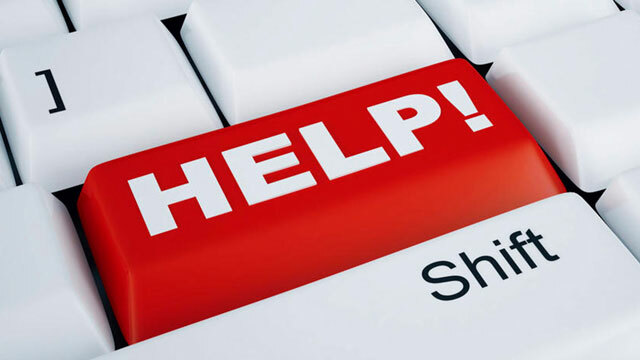 All of these containers can be purchased at Wal Mart or even Dollar Tree for about $2 each, and the items inside the boxes I get at craft stores or Wal Mart, or I may be able to use household items or materials found at the client's house. This is a sensory box filled with sand. I use purchased sand rather than sand from a beach or park so I know it is clean and not filled with dirt, bacteria, or things like pieces of wood. I place a few items inside the box for the child to manipulate such as the multicolored rings. This way you can embed tasks by saying things like "Give me the red ring" or "Pour sand on the orange ring". These boxes are filled with varying pebbles/marbles and stones. Again, I purchase these rather than collect them from outside. I put in different textures, colors, and sizes so they are more interesting to manipulate. This is a pasta box. You can use any type or color pasta you would like. Some parents don't like to use sensory boxes with food items inside (flour, pasta, etc. ), because the child will try and eat the items. You can either not use food items, or you can teach the child rules for playing with the sensory box. One of the rules would be "No mouth/No eat". A visual for each rule could be taped or laminated onto the lid of the box, to help with teaching how to appropriately interact with the sensory box. This box has beans inside. Another way to incorporate language into this activity is to gently close the box by placing the lid on, and then look at the child. They can then use their method of communication to request that you open the box or to request using a label, e.g. "beans". I have some clients who love these boxes so much they do not want me to put my hands into the box. They will push at my hands or become upset. When that happens I prompt them to communicate to me that they want to play alone. It's okay to play alone, but shoving at me isn't the best way to let me know. So we alternate between alone time with the box and cooperative play. This box is filled with rice. The rainbow effect on the rice can be obtained by adding a few drops of food coloring to the rice, stirring the rice, and then letting it sit and dry. Another language tip is to use the sensory boxes to teach choice making. To do this I will place a highly preferred sensory box on the table, and something that is very non preferred, like a book. The child can then receptively or expressively indicate which item they want, by making a choice. For parents, if you have difficulty in public situations such as waiting at the doctors office try bringing a small sensory box along so your child has something to do while they are waiting. Manipulating these items can also have a calming effect, besides just being fun! *Resource: A parent told me about this GREAT website called Small Potatoes that has some of the most creative and imaginative sensory boxes I have ever seen!